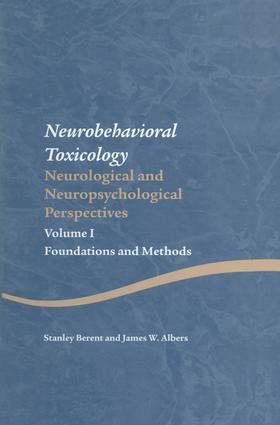 This book, the first of three volumes, provides a thorough background to the emerging field of neurobehavioral toxicology by looking at current clinical approaches and tests, as well as assessing current clinical research. The analysis of the impact of toxins on the human nervous system is particularly pertinent given the ongoing expansion of pharmaceuticals, industrial hazards, biological warfare and global pollution. A comprehensive introduction to neurobehavioral toxicology, this work will be of interest to practicing neurologists and neuropsychologists, as well as to occupational medicine physicians and medical toxicologists. James W Albers is a physician who specializes in Neurology. He is affiliated with the University of Michigan Health System, where he is Professor of Neurology and Director of the Electromyography Laboratory and Co-director of the Neurobehavioral Toxicology Program in the Department of Psychiatry. James Albers has published over 25 articles in peer-reviewed scientific journals in addition to approximately 25 book chapters. Stanley Berent is Professor of Psychology at the University of Michigan.